The pictured sampler is indeed a work of art. During the sixteenth century samplers were often a record of the life and times of that period. Few examples of these samplers exist. Jane Bostocke's sampler of 1598 includes the embroidered date. This is the earliest known sampler to include a date. The date commemorates the birth of a child. The needlework is of a very high quality, and Jane may have been hired for her needlework abilty. An amazing visit to the Victoria and Albert Museum in London, England would allow the visitors to hold this and other historical needlework in their own hands. The needlework is encased in a wooden tray with a glass covering. 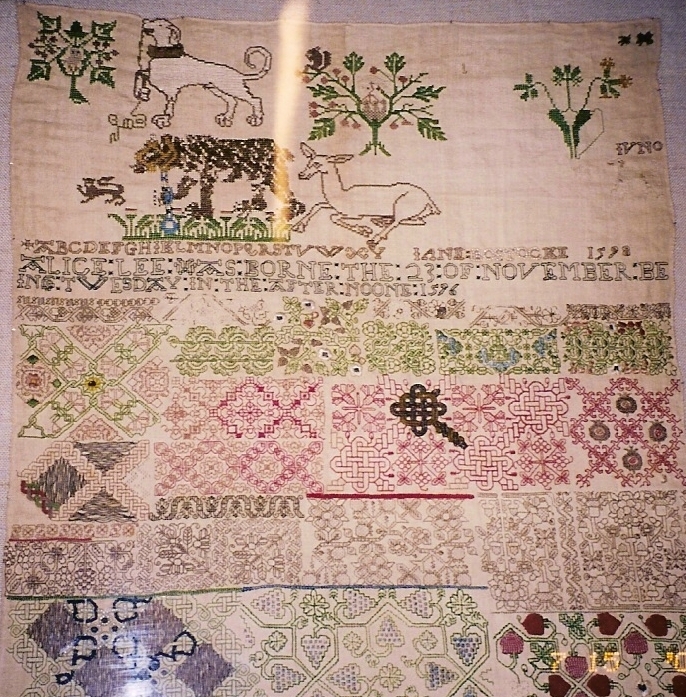 This means that the sampler can be viewed with time and the closeness that a stitcher would want to fully appreciate this work of so many years ago. The beams of light flashing across this sampler were the results of my inexperienced photography. I took this picture with the simplest of cameras a few years ago. During the three years of "A Journey with Needleart-From the past to the the future" we will not feature needlework from the 16th century. Examining a historical sampler with all the fine details and threads of long ago can help each stitcher and lover of needlework appreciate the work of that period and those of our time.